At this stage you might say, “Why try?” But this time I’m trying something new. This time I’m actually going to succeed. I have to. At my age it gets harder and harder to lose the weight. My body has settled into a sort of inertia where it doesn’t just get harder to lose it as each year passes. It’s an impossible dream as each week passes. Those pounds stick to me as tight as a tick after a summer hike. Excess weight means problems with my newly diagnosed osteoarthritis. I could have trouble just getting up and down in a yoga class. I’ll have no hope of fulfilling a desire to hike to the bottom of the Grand Canyon and back up. It means I may not take a bike tour through Italy or Vermont. Or, even worse, I may not be able to get up and down the three flights of my beloved French apartment or easily walk the cobbled streets of Dijon. And losing just 10% of my current weight can bring me so many health benefits, like lowering my risk for heart disease. Of course there is no end to tips on how to cleanse my body and lose weight. Yes, I’m full of toxins and inflammation from fast food, too many carbs, and an addiction to sugar and foods with a high fat content. I accept the fact that I need to fill my body with healthy food full of antioxidants and vitamins and the right kind of protein and all those good things. But how? Never eat after 7 p.m.
Others suggest fasts or cleanses to flush out toxins. The primary effect is to leave you with a kitchen pantry full of things you’ll never use again, such as quinoa, sauerkraut, prunes, kale, and a juicer you bought specifically for those three magic days. The frustration of trying to clean the darn thing caused you to give up even sooner than the kale and artichoke juice that was supposed to be your lunch all weekend. Others offer miracle food delivered right to your door. It does take the effort out of dieting in terms of portion control and not having to think about what you’ll eat. On the other hand, it tastes almost as good as the packaging it came in and, because it needs to have a long shelf life for shipping, it’s filled with the chemicals and preservatives that I really need to extract from my body. So for my spring-cleaning of the body I’m desperate enough to try something new. I’m excited about it and am eager to share this new amazing strategy I’ve adopted for gaining energy, dropping pounds, and cleaning out all the gunk clogging up my system. A good friend shared her secret with me after listening to all my excuses for not losing weight. She listened to my whining about how hard it was. She listened to the problems I found with most of the weight-loss programs out there. She listened to my “I should, buts . . .” and “I would ifs . . .” and then she told me that I was making it too complicated. She had me repeat the four words that will bring me a new body: I EAT HEALTHY FOOD. Nobody knows better than me what healthy food is. After years of trying to lose more than a token 15 pounds only to gain back 20, I know what an appropriate portion size is. I know that I shouldn’t step foot in a fast food place (“Oh, it’s ok. I’m going to order from their healthy menu.” Yeah, right). So my dear friend made me say aloud “I eat healthy food” and post that message anywhere and everywhere. At my computer, in the car, in my bedroom so I’ll see it first thing in the morning. See it. Say it. Do it. And you know something? It seems to be working. There have been times my old food routines tempted, but I repeat my new mantra and make a better choice. It’s a start. My healthy food record is about 60% success and climbing. I’ve gotten back to cooking, which gives me more control over my food. Little by little I’m boxing up my old food habits and carting them off to the trash. And I now have the energy to do that because I eat healthy food. Healthy food in moderation. It’s a scary prospect. Desperation makes me willing to try anything. I’ll keep you posted. What’s your own recipe for a “spring cleaning” of the body, whether it’s food choices or an activity or something else? What’s your greatest struggle when you attempt it? Share your story in the comments box. If you’re wondering what’s a quick and easy way to know if you’re eating healthy, take a look at the picture above. 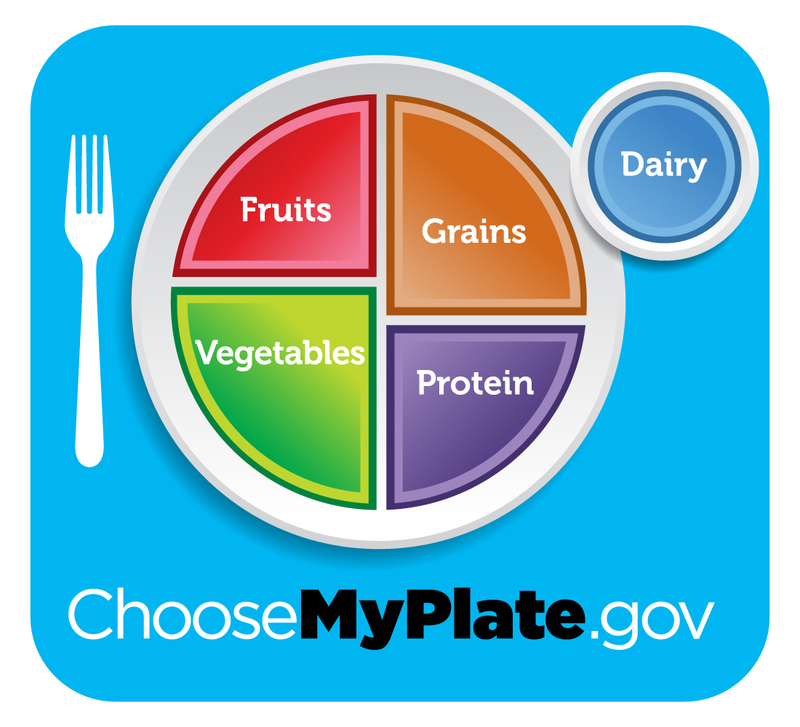 The USDA has replaced the familiar food pyramid with a new food guidance diagram to remind you what a healthy meal looks like. Trying to model the plate is a good start to cleaning out your body. This post is in response to another Mama Kat prompt. Drop by to see what others wrote. Huzzahs and other words of encouragement. Is the kitty in the banner yours? Looks so much like my Henley, a Burmese. That is brave to put those "sticky notes" out there! I'm with you all the way and know you can get back to where you want to be. Keeping it so simple relieves all the pressure. I wish I could portion my food out like I do the dogs - half a cup twice a day. None of them have a weight issue! I'm with you, Melinda. My dogs never have a weight problem. I wish I could be as disciplined with my own food. Lee, the cat is a French cat from an unknown window in an unremembered French village. I love all the surprises in French windows! Julie, I wish you good luck! It's a daily struggle, but the most important thing is to keep trying. You're taking a wonderful, healthy approach to this, so congratulations on making a positive decision. I'm a firm believer in moderation. I've done a number of cleanses over the years, but I never do anything extreme. I don't fast or drink just juices. However, I will say that over time, things like quinoa and kale start tasting pretty good, and I ALWAYS have them on hand now. The kale comes fresh out of my garden, and it's delish. You can do this, Julie! We're all cheering you on. Way to go, Julie! You're off to an impressive start. I'm convinced that my internal dialogue is as important to changing my bad habits as the actual doing of them. I love it and I might even try it! I've desperately been trying to shed about 7kg for the past 18 months but I can't seem to do it. Good luck with it, Julie. I know what a struggle weight can be -- I've struggled with it all my life. Something in your brain will "switch on" and you'll be able to do it. That's what happened with me. I do use WW - sort of. It gives me some motivation and a place to check on restaurant food before I'm tempted (you'd be surprised at how unhealthy much "healthy" restaurant fare is). I do know if I don't track my eating (a key in WW), I don't lose weight consistently. But WW does leave it up to you to make all the choices -- the hard part. I wish you every success – I know it is not easy to stay focused on your goal, but you can do it. Bonne chance! For m, there is only one thing that works: WW and bikram yoga at least twice a week. Weird but true. Good luck to you: it seems to me that you have the right mindset. I can understand your journey. I decided last year to "get healthy." I joined Weight Watchers and began vigorous exercising at least 3 days a week; I lost almost 25 pounds (and wrote about that journey on my blog); I learned that I could eat anything, in moderation. Best of success as you take off the pounds. For good. P.S. I stopped by from FB Gypsy Nesters and I'm happy I did!